DAY 1 and 2 : The biggest challenge you can see here is how we had such a LONG SKINNY booth this year. The floor space is big 30 feet wide by huge 70 feet long. That seems VERY BIG, but in the past, we had 60 feet instead of 30 wide, so we had to come up with a plan that would maximize the fan interaction, allow as many of you to come participate as we could and make as many of you not upset that you could not come build because the room was always filled to capacity. Which does happen at past shows, so no guarantee it won't again, but we are trying to minimize that. Thursday and Friday give us a massive 30 feet long x 16 feet wide Diorama area. Since most of the builds aren't create yet, it makes sense to keep this smaller in the beginning. The center you see a hole with a trash can, power bar symbol and 7 chairs. This is where you guys will join me to do a group build of the 8 foot tall CITADEL TOWER. 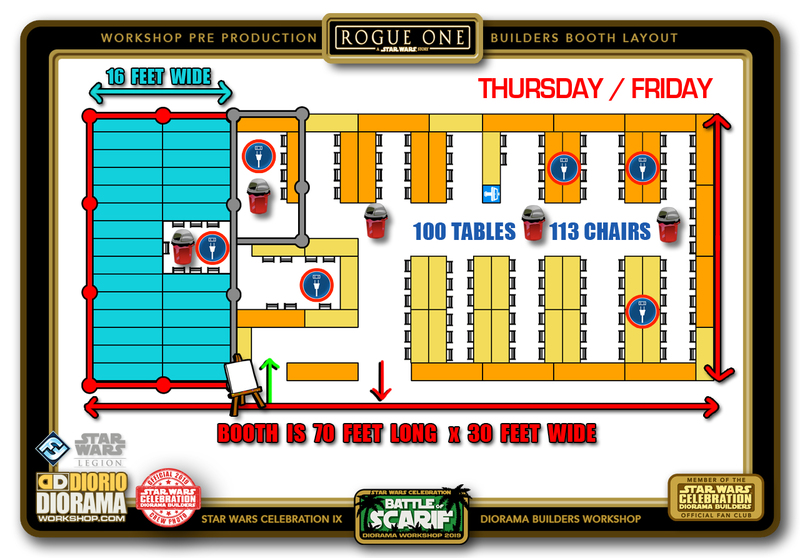 the massive size justifies us using these tables and not taking over the right side, main building area. Above right, is the crew's war room, where we escape all the stress and when we want to grab a bit to eat and not drool all over the fans LOL. Below that is Duke's Welcome station and where you will pick up all your building supplies. From there you will make your way towards the right side of the booth and grab one of the 113 chairs and start making your piece of Scarif 🙂 The selection of what to build will be many but that is still to be locked in, we will have to wait for a future post to find out more about that. DAY 3 : The first thing you will notice when coming to the booth is that an additional 8 feet have been added to the DIORAMA area. This is for 2 reasons... a) there will have been a lot of builds the past 2 days and we need a place to start laying them down 🙂 and b) we still need a lot of space to FINISH our CITADEL TOWER today. The plan is to have it erected and in permanent place on the Sunday when everyone arrives. A larger area for the dioramas shows you that a little space had to shrink on the builders side. 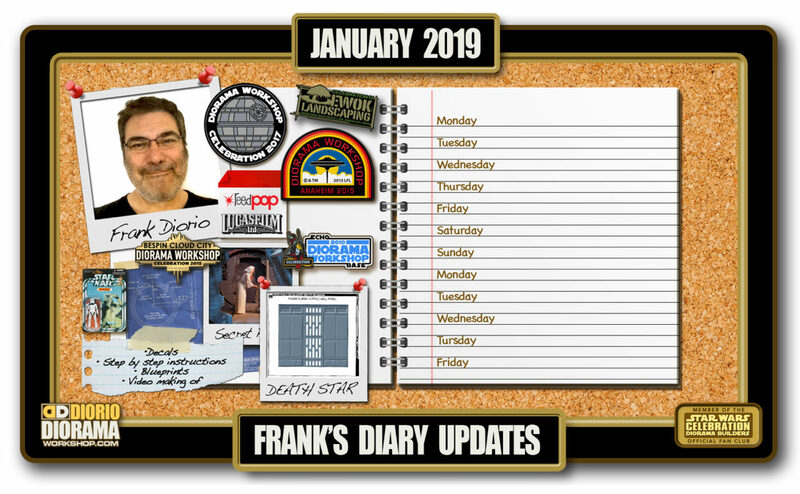 We scooted over the War room as well as the welcome area but keeping a maximum of stables and chairs for the MANY fans that show up on the first day of the weekend. Saturday is always the biggest day in terms of construction. DAY 4 and 5 : The FINAL Diorama tables are put in place giving us a MASSIVE 30 feet x 36 feet table top surface. This is where the MEGA CITADEL TOWER will be seen as well as all the fans islands, Imperial Bunkers and some cool Foamcore ship models, all made on site during the convention by you guys, the Diorama Builders Star Wars fans. 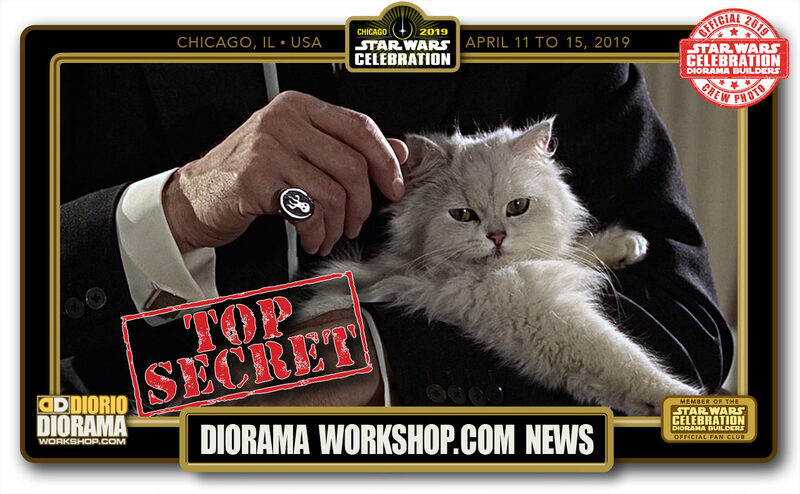 During these 2 days is when the Diorama really comes to life as well as each build is now placed in the Diorama to fit a giant Scarif puzzle. Sprinkle in thousands of FFG Star Wars Legion toys and you will get the most EPIC table top diorama EVER SEEN at a convention 🙂 It's just gonna be sooo cool. Let's take a look at the 3 morphing phases of the booth side by side shall we ? 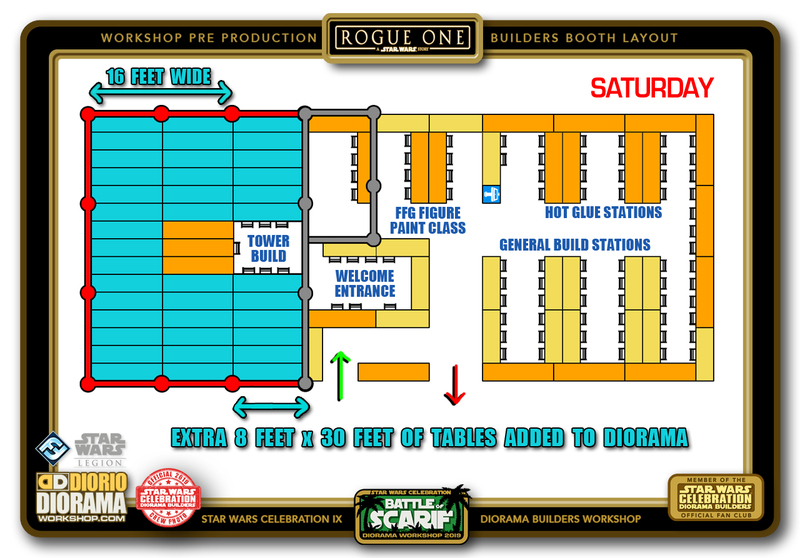 It just makes total logical sense now, after 3 weeks of pulling our hair, that we keep the top building area as large as we can for as many days of the convention we can to maximize your participation and minimize the frustration of waiting hours in line to get in. 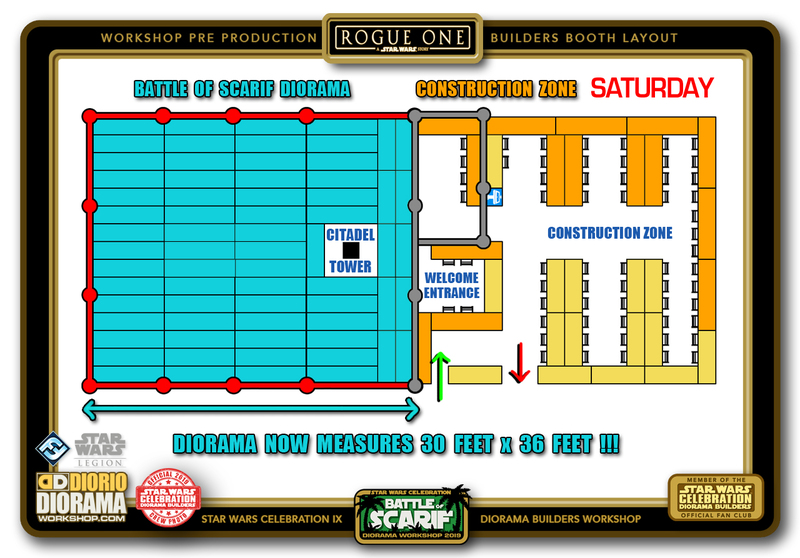 So as you can see, on the left, Thursday and Friday, you will have the Diorama Area at it's smallest since nothing will really be ready for final display and it will give me and a few lucky fans brave enough to join me in the Group CITADEL TOWER build enough space to start construction. At the top. 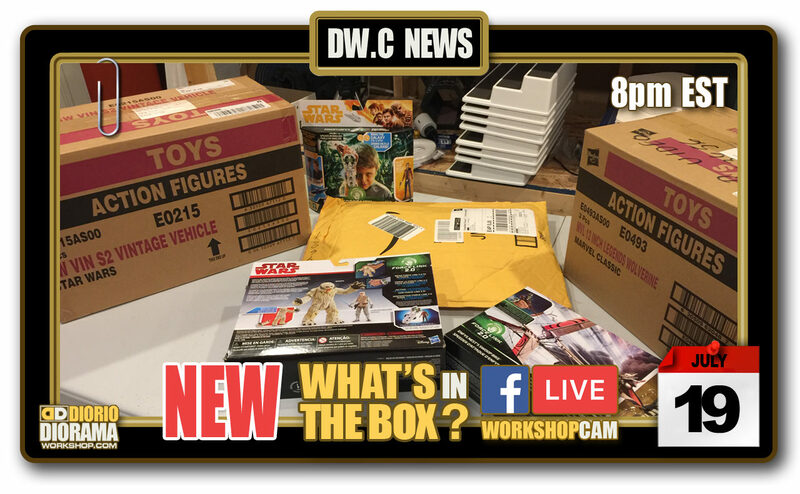 all the fans will be kept busy making all kinds of cool creations, from Ocean tiles, to Beach tiles and Jungle tiles, Palm trees, Bunkers and Towers and foamcore paper ships and AT-ACT's. AMAZING !!! 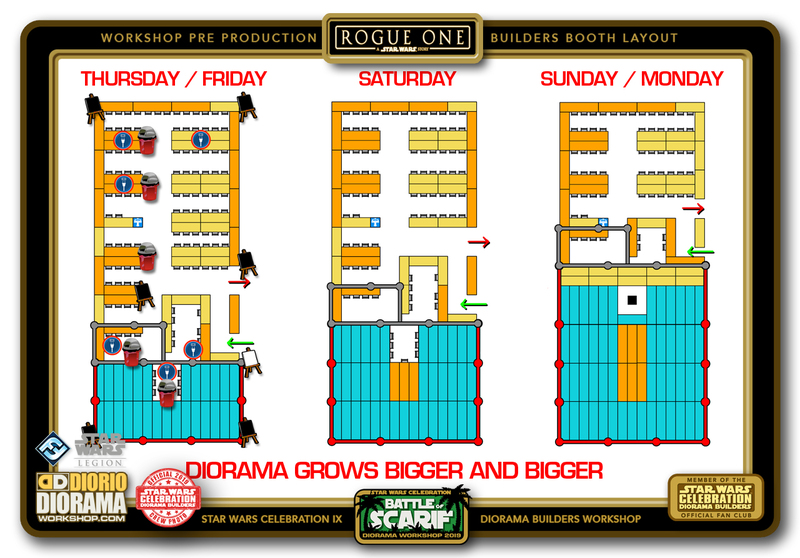 Middle shows you how the Diorama area grows 1 row of 8 foot tables while only loosing 2 islands of tables and chairs. The right is the final morph. Half construction and hald Diorama display. 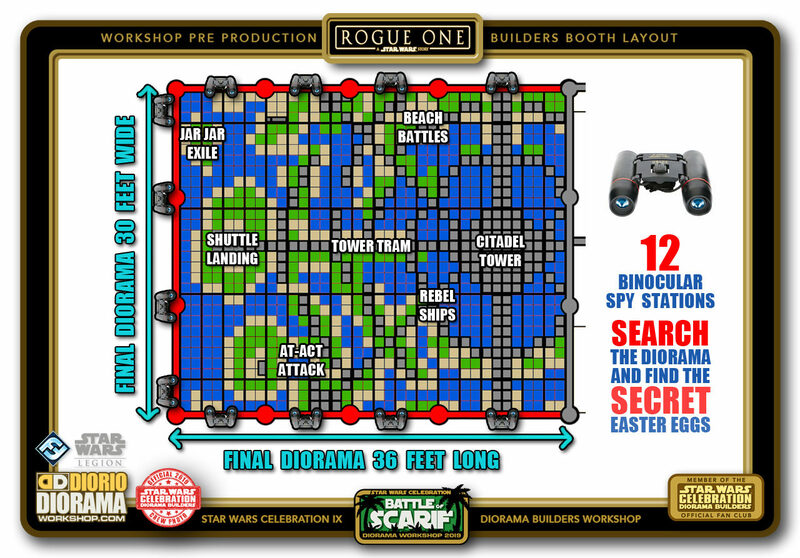 With the Citadel Tower at the center top drawing your eye to all kinds of Rogue One sweetness. I can't wait till April. It's gonna be just so much fun and with FFG, a total change for us that doesn't just affect the construction techniques, but the whole look of the final diorama. WOO HOO !!! 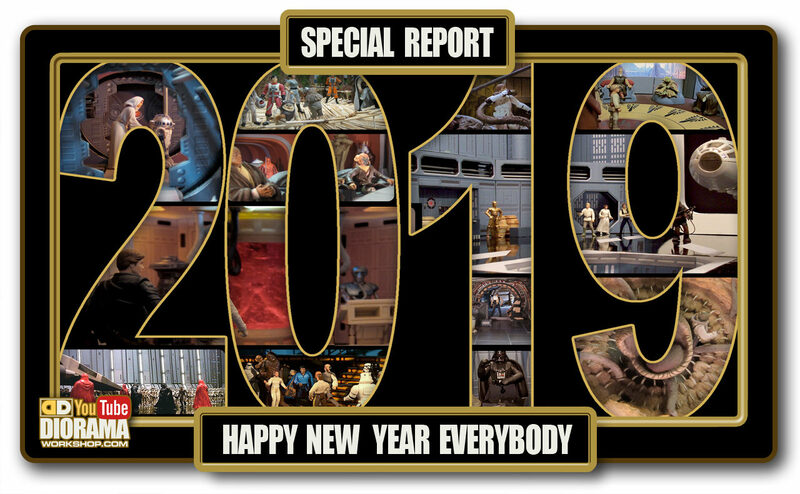 Did you attend this Star Wars Celebration ? 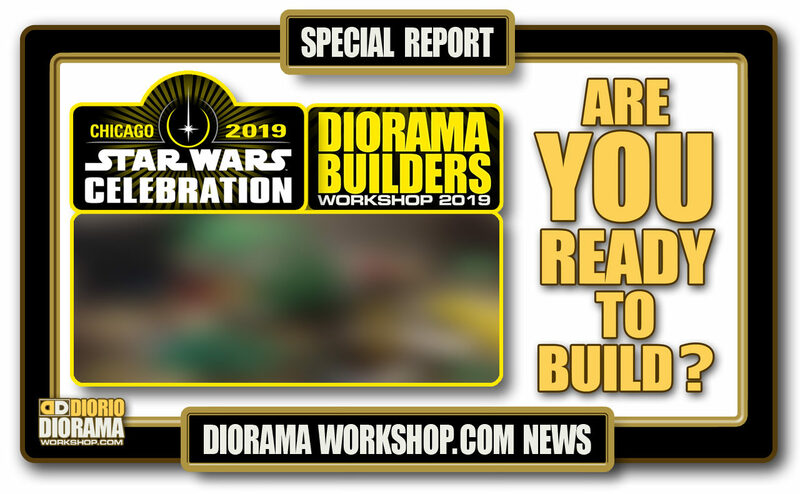 If you took photos and would like to have them included in this gallery, please email me DIORAMAWORKSHOP.COM@GMAIL.COM … If you have a facebook account, why not join the Official Diorama Builders Fan Club today, simply click the logo link below.